I am often asked about the number of subjects needed to study a binary outcome, which usually leads to a discussion of confidence intervals for binary proportions, and the associated precision. Sometimes the precision is quantified as the width or half-width of a 95% confidence interval. For proportions, I like the Wilson score interval because it’s simple to calculate and does not violate the constraints of probability estimates (i.e., estimates must be between 0 and 1). Below is a function that computes the Wilson interval, given the number of trials (n) and the fraction of events (p). 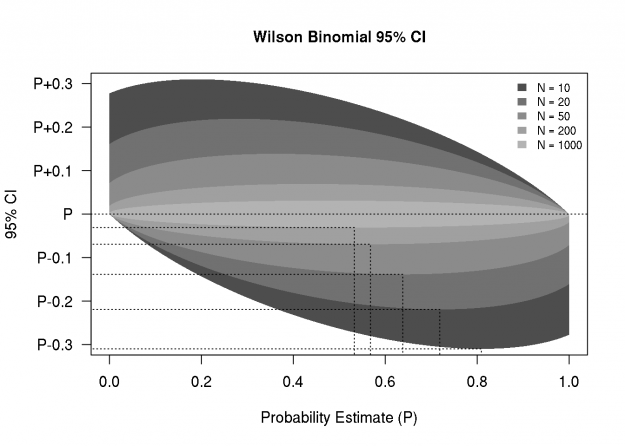 The code below generates a figure that illustrates the 95% confidence bounds as a function of the probability estimate, and for a sequence of trial sizes. I’m posting this here for my future easy access, but I hope some readers will find it useful as well, or might suggest improvements.